With its picturesque hill stations, serene backwaters and majestic beaches, the state of Kerala has become an all-time favourite destination for thousands of honeymoon couples coming from all around the world. All of them have just one thing to say, “Kerala has romance in its air”. There’s no doubting that statement. In fact, Kerala tourism has received the ‘Best Destination for Romance’ award in 2017. The state has a large number of resorts and hotels that are ideal for honeymooners, offering them an unforgettably romantic experience. 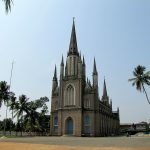 If you plan to visit Kerala for your honeymoon, you must make sure you know what hotel or resort to choose so that your honeymoon can be absolutely amazing. We know you and your spouse would like to cherish your honeymoon memories throughout your life. 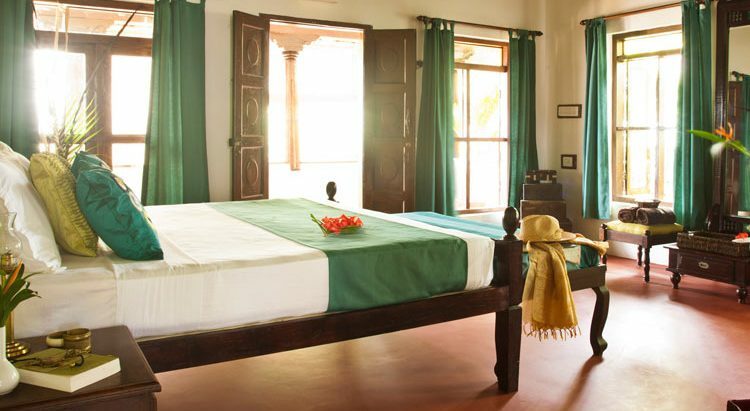 Here’s a list of the top 10 boutique hotels in Kerala for the perfect honeymoon. 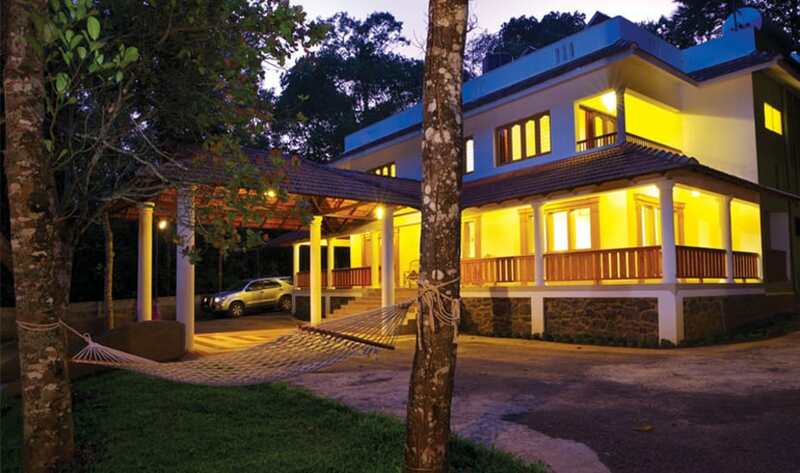 The Wind is a boutique hotel in Munnar tucked away on a cliff-edge far from the busy town area. Because of the hotel’s stunning location, its cottages offer scenic views of the verdant valleys and the mist-clad mountains through their large windows and spacious balconies. The picturesque view from the well-furnished ‘Honeymoon Cliff-Edge Cottage’ creates a romantic atmosphere, making the cottage a perfect choice for honeymoon couples. The top-notch services and warm hospitality make the stay at this hotel even more special. The Rainforest Resort in Athirapally, located inside the pristine Sholayar forest, offers a mind-blowing view of the majestic Athirapally Waterfalls. It features luxury rooms, a beautifully designed tree house and a spacious private cottage also. 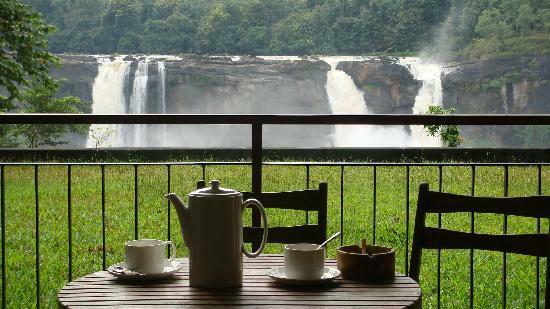 Every single room in the boutique hotel offers a delightfully refreshing view of the waterfalls. The resort displays unique architectural beauty and its rooms have chic interiors as well as high-class amenities. Even the charming infinity pool, which has thick foliage around it, provides a nice little glimpse of the waterfalls. 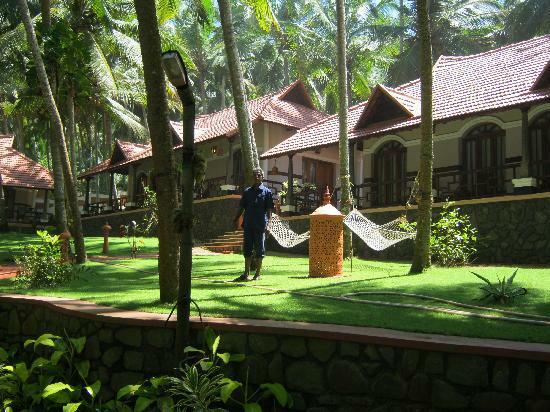 The Thapovan Heritage Home is a pleasant wellness resort that offers sweeping views of the Arabian Sea. With lush green gardens and alluring coconut trees spread throughout the property, the resort enjoys a refreshing environment that perfectly complements the rejuvenating ayurvedic therapies offered inside it. The cottages at the resort feature an ethnic design and provide views of the garden. The resort staff can arrange to take honeymoon couples to nearby villages, markets and festivals so that they can get glimpses of the village life in Kerala. Tissa’s Inn is a boutique hotel in the heart of Fort Cochin, a historically significant town in Kerala. Housed in a grand mansion, the hotel features 9 well-appointed luxury rooms. 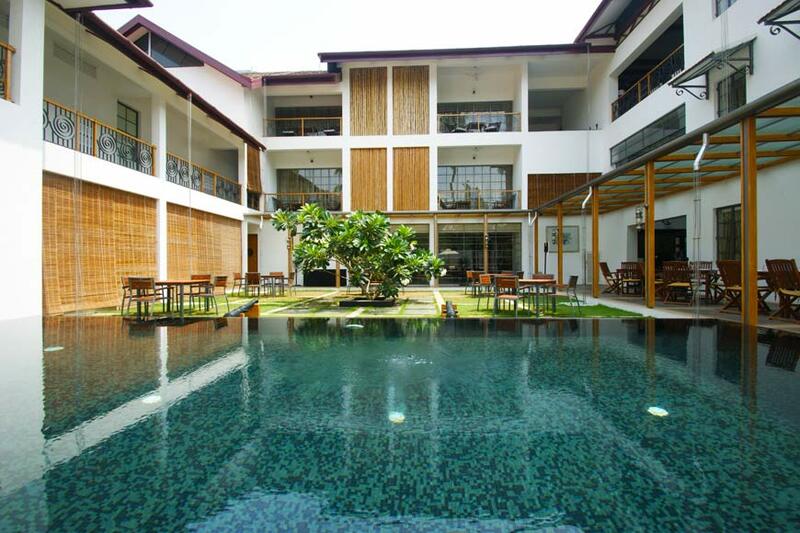 It has a beautiful rooftop swimming pool that enjoys a calm and quiet atmosphere. The restaurant at Tissa’s Inn specializes in seafood, both in Indian and Continental style. Couples staying at the hotel can enjoy romantic boat rides as well as ayurvedic spa therapies or watch cultural programmes arranged by the hotel. 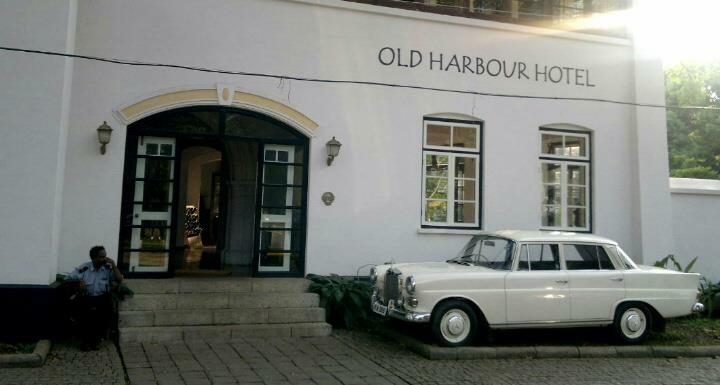 Old Harbour Hotel, located in Fort Cochin, was a 300-year old heritage monument that was brilliantly restored and renovated to become an exquisite boutique hotel. Its architecture has Dutch and Portuguese influence and hence, the old world charm of the hotel is very evident. The hotel property has a large garden, an open terrace as well as a swimming pool. It also has a stage for cultural performances. The spacious suites and cottages in the boutique hotel feature elegant interiors with lovely decorative showpieces. They offer nice views of the garden and the famous Chinese fishing nets. Located on a peaceful street corner in the centre of Dutch Cochin, Eighth Bastion Hotel is an elegantly designed boutique hotel that celebrates Dutch heritage and culture. The architecture of the hotel and the food they serve clearly show the Dutch influence. The spacious rooms of the hotel have plush interiors as well as modern bathrooms. Some of them open to airy patios and balconies. The hotel has a delightful infinity pool, a restaurant serving mouth-watering delicacies, a sparkling fountain as well as a coffee lounge in the lobby. 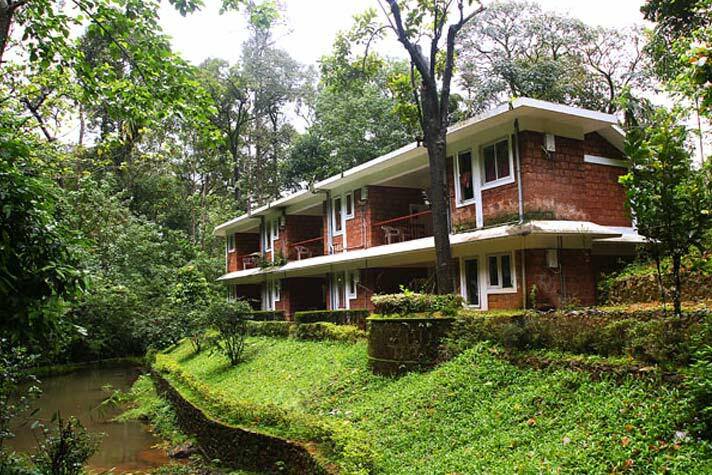 Coffee Routes Resort, a beautiful boutique hotel located in the wild and adventurous town of Thekkady, enjoys a serene natural environment. With an unspoiled landscape spread across the 4-acre property, the resort has elegant bungalows and cottages. The open air lobby has seats hewn from beautiful rocks and just above the lobby is a multi-cuisine restaurant that looks out into the lush green environment. The main block has two floors with gracefully designed rooms. 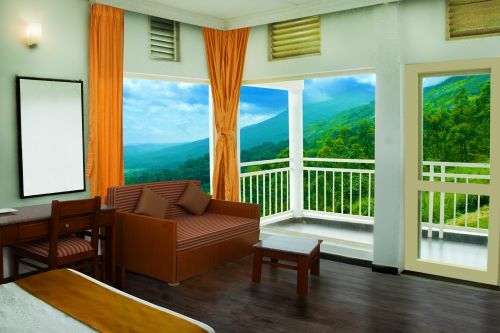 The rooms come with balconies that offer a view of the verdant landscape that has a variety of trees as well as flowering plants. A few twin-floored cottages are located close to the main block. They offer a view of the pool on one side and a stretch of fields and mountains on the other. Falling Waters is an exquisite environment-friendly resort located in a picturesque forest found in the outskirts of Munnar. The property has a natural waterfall as well as a sparking stream that contribute to the raw wild atmosphere enjoyed by the resort. The suites, built right beside the stream, feature a private veranda which is ideal for reading and also writing. The restaurant at Falling Waters has an elegant design and offers candle light dinners for honeymoon couples. On special request, the resort staff arranges candle light dinners amidst giant forest trees in the natural garden of the resort. 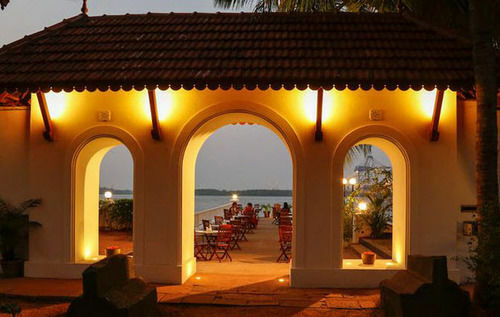 The Fort House Hotel is an admirable boutique hotel located in Fort Cochin, close to the waterfront in the town. The property is beautifully decorated with lanterns, statues and lush greenery. The hotel has spacious, airy and luxurious rooms. There is also a tropical garden in the property. 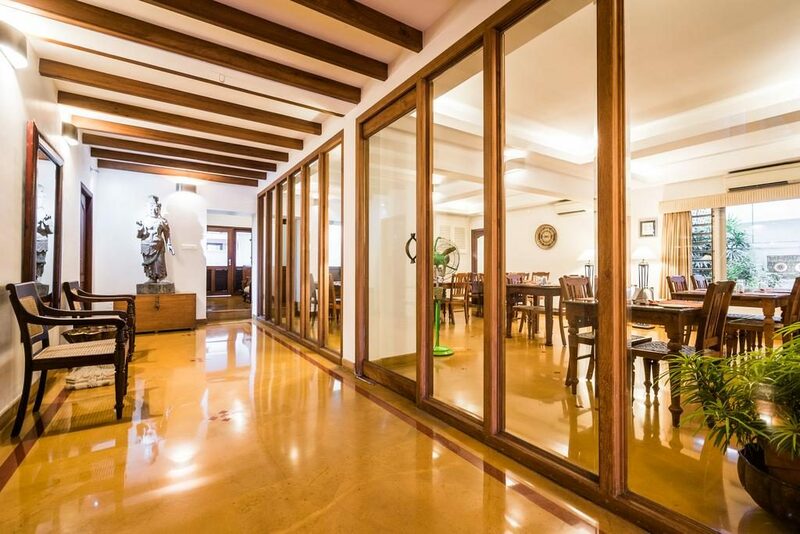 The balconies of these rooms offer pleasant views of either the garden or the backwaters. The hotel has a waterfront restaurant that enjoys a captivating ambience because of the fresh sea breeze and the sound of water. 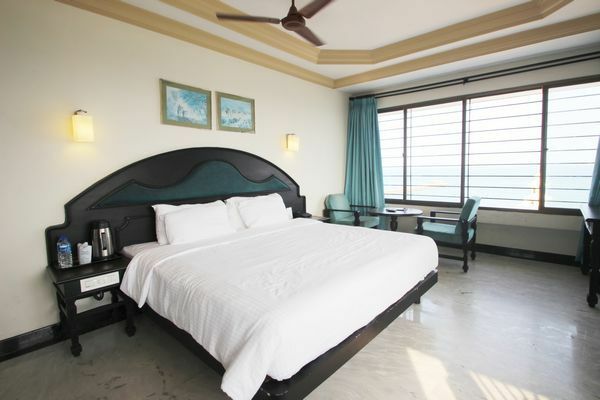 Hotel Sea View is a 3-star hotel in Kanyakumari, a town in the southernmost tip of India. Situated amidst the busy city life of Kanyakumari, the boutique hotel offers unparalleled views of the magnificent Indian Ocean from its rooms. Some rooms also offer a view of the sunrise directly from the bed. The terrace of the hotel, however, offers the best view of the sunset. The hotel arranges romantic candle light dinners for honeymoon couples. Couples will especially love the view of sunsets and the pleasant boat rides in the ocean. Your posts are very nice and informative.